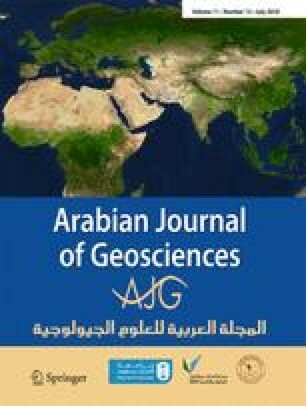 The present work assesses the potential industrial uses of Paleocene limestone deposits, Garra Formation in Sinn El-Kaddab Plateau, South Western Desert of Egypt, based on their mineralogy and geochemical characteristics. Eighty-six limestone samples collected from ten stratigraphic columnar sections were analyzed using X-ray diffraction (XRD) and X-ray fluorescence (XRF) techniques. Petrographically, Garra limestone deposits consist dominantly of benthic foraminiferal wackestone and packstone microfacies. The XRD data revealed dominance of low-Mg calcite as essential carbonate mineral in the studied limestone. The bulk rock XRF results revealed CaO (29.28–55.75%) with an average of 52.74%. The CaO exhibits a strong negative correlation with MgO, SiO2, TiO2, Al2O3, and moderate negative correlation with Fe2O3 which indicates that the contribution of these elements is mainly due to detrital input. On the other hand, Al2O3 and Na2O contents exhibit significant negative correlation with loss of ignition (LOI) wt% indicating their incorporation within terrigenous matrix. The average Sr content attains 1297 ppm indicating deposition in temperate marine environment. The average molar CaCO3% values of bulk samples have been computed for individual columnar sections to determine the purity status of Garra limestone deposits. They range from impure (CaCO3% = 79.92%) to high-pure (CaCO3% = 97.76%) limestone. Therefore, Garra limestone deposits have extremely valuable uses in a wide spectrum of industrial applications including Portland cement, steel, ceramics, whiting, chemical uses, paper, and feed stuff. This project was supported financially by the Science and Technology Development Fund (STDF), Egypt, Grant No. 4440.